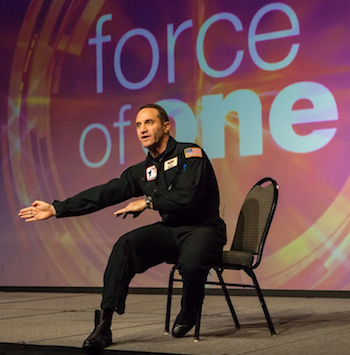 An engaging motivational speaker, Waldo’s high energy, customized, multi-media motivational keynotes are a perfect way to kick-off or close your annual sales meeting, partner conference, or association convention. The missiles of our economy are affecting us more than ever. The key is learning how not to get shot down! 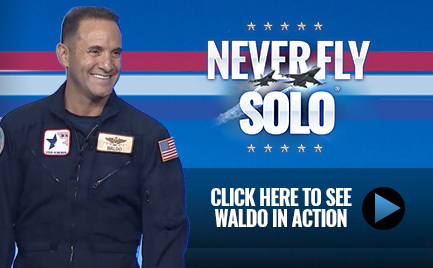 Waldo puts you in the cockpit of a high performance jet and shows you how to overcome fear, adapt to change, build trusting relationships with your wingmen, and take action that leads to results in business and life. Click to view Waldo’s most popular motivational keynote presentations. Waldo’s objective is to promote organizational cultures that embrace the wingman characteristics of disciplined training, dedicated teamwork, courageous leadership, and unwavering trust. He will inspire your team to build trusting, revenue producing relationships with their employees, partners, customers and clients through his motivational keynotes. Watch Videos of the Wingman in action! Let Waldo help make your next corporate meeting or training event a unique and exciting experience with a business motivational keynote or sales keynote. 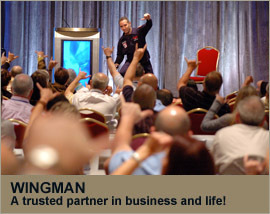 Contact the Wingman today at 1-866-925-3616.